Russian consumers apparently feel no need to save for a rainy day, opting instead to spend their way to happiness. According to a review published in late June by Boston Consulting Group (BCG), 60 percent of Russians (more than in any other BRIC country) assert that the global financial crisis has had an immediate negative impact on them, and only 29 percent expect the economic situation to improve within a year. 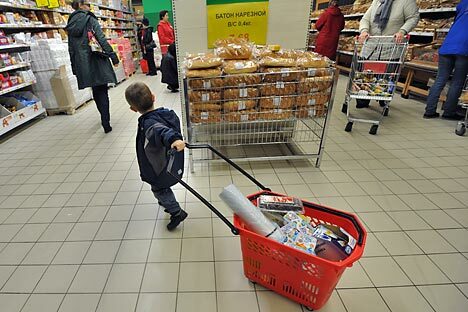 According to Nielsen, 69 percent of Russians believe that this is not exactly a good time for shopping. Yet, they shop. The mentality seems to say seems to be that there is no point in saving for the future and it’s better enjoy what you have now. According to Nielsen, only a third of the Russian population actively saves, compared to the global average of 50 percent. BCG puts the figure of savers at only a quarter of the population, which is less than any of the other 16 countries it has reviewed. The Russian Economic Ministry recently announced that in the first quarter of 2012, the propensity to save hit a three-year low. The news cheered analysts tracking consumer behavior. According to Renaissance Capital, in January-March 2012, personal consumption accounted for almost 4 percent of the year-on-year 4.9 percent GDP growth announced by the Federal State Statistics Service for the end of the first quarter. Of course, this is only true provided that household consumption expenditure makes up roughly 53 percent of Russia's GDP and real consumer spending actually surged 7 percent year-on-year. In a statement made after the announcement, Renaissance Capital said: “Russian consumers have consistently ignored pessimistic expectations. This kind of behavior encourages economic growth in the future." It is, however, fairly irresponsible on the part of consumers. Yet many Russian consumers do not want the responsibility; they just want to be happy. According to studies, happiness is hard to come by in Russia. BCG maintains that Russians are “the least satisfied with their lives other than the Greeks, who are going through a deep financial crisis, and the Japanese, dealing with the tsunami aftermath.” A BCG survey found that only 47 percent of Russian respondents admitted to being happy and satisfied with their lives. In comparison, the figures are far more upbeat in other BRIC countries: 78 percent in India, 67 percent in Brazil, and 62 percent in China. The New Economic Foundation in the UK found showed similar results in its Happy Planet Index, ranking Russia 122 out of 151 countries surveyed. Where are Russians happiest? Apparently at the entrance to the nearest mall. A recent survey showed that 42 percent of Russians agreed with the statement “The more I buy, the happier I feel.” Russians are almost unique in this respect; only Brazilians sho a similar level of shopaholism – 40 percent of them agreed with the statement. Alexei Belyanin said that Russians do not feel a similar thrill going to sporting events, the movies or the theater because they did not have these experiences as children and therefore do not have a primal response to them. “A shop, conversely, is a primitive treat well known since childhood. And it is reproduced all the time, because buying another pair of shoes is really pleasant,” Belyanin said. Although some people are known to have a penchant for shoes, Russians mostly buy clothes (46 percent, according to Nielsen) and personal technological devices or household appliances (34 percent). It is slightly different with groceries: According to food giant X5 Retail Group, the medium- price segment is gradually shrinking and the demand is gravitating towards economy class products. The demand for luxury goods is, in turn, slightly expanding, owing to a decrease in the premium segment, although this might also be a signal that the consumer is maturing. “The fact that people have started saving on groceries and buying more non-food items (clothing, household appliances) indicates that they tend to live less in the present and are more forward-looking,” said Ilya Belonovsky, CEO of the Association of Retail Trade Companies. BCG data shows that the share of consumers intent on buying more expensive goods and services has shrunk to 18 percent (down 4 percent from 2011). Furthermore, 43 percent of respondents confirmed that the crisis had caused them to change their habits: they put off considerable purchases, look for the best prices and never miss a chance to buy cheaper items during promotional events. However, this pattern is common for 55 percent of the population in France, and for 62 percet in Italy. In terms of luxury consumers, Russia is far ahead of other countries, again with the exception of Brazil (23 percent). India, which, incidentally, ranks third, has 14 percent, and Japan – a meager 5 percent. In May, real salaries were 11.1 percent higher than in May 2011, the Federal State Statistics Service reported. In general, salaries have been growing by just over 1 percent (after the necessary seasonal adjustments), but the upcoming rise in utility rates scheduled for July will change the picture, according to Dmitry Belousov, a leading expert at the Center for Macroeconomic Analysis and Short-Term Forecasting. Even so, Belousov still forecasts a 5-5.5 percent rise in real earnings by year-end. According to the Center’s experts, retail turnover will also expand by a little more than 5 percent. Whether or not these forecasts will actually be met depends on a range of hard-to-predict external circumstances: oil prices, further economic developments in Europe and China’s real economic growth rate, among others. “If it’s the rise in utility bills alone, we will survive it, given the traditionally faster salary dynamics in the second half-year. But if the rise in utility rates is combined with devaluation, it might put a real drag on the economy,” Belousov said. This is precisely the scenario that reasonable consumers fear. “Amid fears of new signs of crisis, increased expectations of currency depreciation and inflation, people tend to spend their money on durable goods rather than deposit it in banks,” said Maria Pomelnikova, adding that this was a typical pattern for Russia in a crisis situation. Eighteen percent of Russians polled by BCG stated they intended to spend their money because savings were not safe. Alexei Belyanin agrees that people consider consumer goods as the only suitable investment option, especially as customer confidence in the banking sector in Russia is very low. Additionally, there is no tradition of individuals investing in the stock market, and the uneven track record of the “People’s IPO’s” of recent years has not encouraged Russians in that direction. In the United States, real estate is often considered an investment, but real estate in Russia, particularly in Moscow is expensive and the system of mortgage lending still fairly new. “It is difficult to say what is a reliable savings option in Russia – the dollar, the euro, Gazprom stocks or diamonds… everything has its drawbacks,” Belyanin said. Belyanin added that the situation in Russia was not quite normal: “With no reliable savings options available, the public is not ready to assume the responsibility for its own future. Such a situation would not be undreamed-of amid a major collapse calling for either martial law or Communism. It should not happen, however, in normal circumstances. All the more so since we are an industrialized society where people have to have the means for economic defense,” he said.